Personnel: Peterson, Brown, Jackson, Karriem Riggins- drums. Like director’s cuts, material scrounged from studio archives isn’t always worthy of release. As with scenes that belong on the cutting room floor, some tracks, particularly from live performances, should remain closeted away—or at the very least held for box set bonus tracks targeting the completist. Hearing the seven tunes presented on What’s Up?, however, reminds us that some moments should never have been allowed to slip by in the first place. 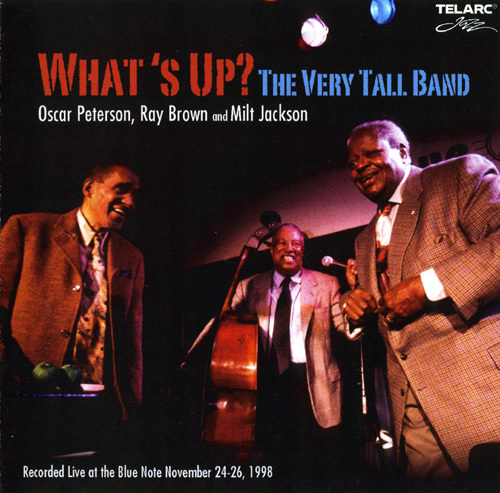 Presenting previously unreleased material recorded during a three-day live performance at the Blue Note in 1998 by Oscar Peterson (then 73), Ray Brown (72), Milt Jackson (75), and a young Karriem Riggins, What’s Up? grants listeners access to three veteran musicians as they stroll their way through a loose, effervescent jam session. A wonderful companion to the originally released material, these seven tracks provide insight into what happens when three masters take the stage without a script. The music resonates with three lifetimes of experience, and it is clear from first note to last that their individual styles were veritably made for each other. 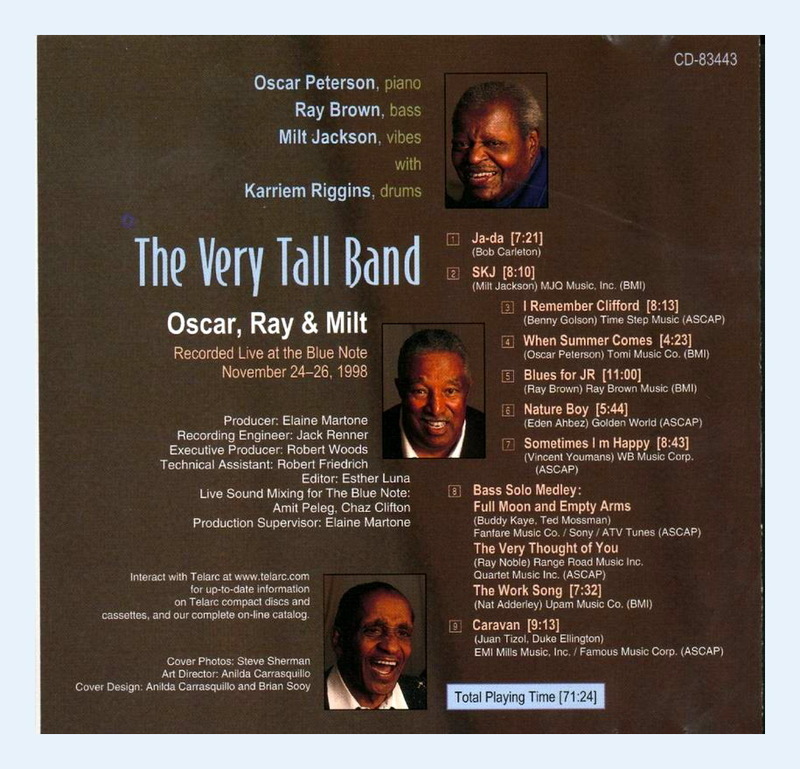 Brown’s deep swing propels each track, while Jackson and Peterson glide effortlessly through classic bop pieces like «Salt Peanuts, the blues tunes «Ad Lib Blues and «Limehouse Blues, and mellow ballads like «The More I See You. 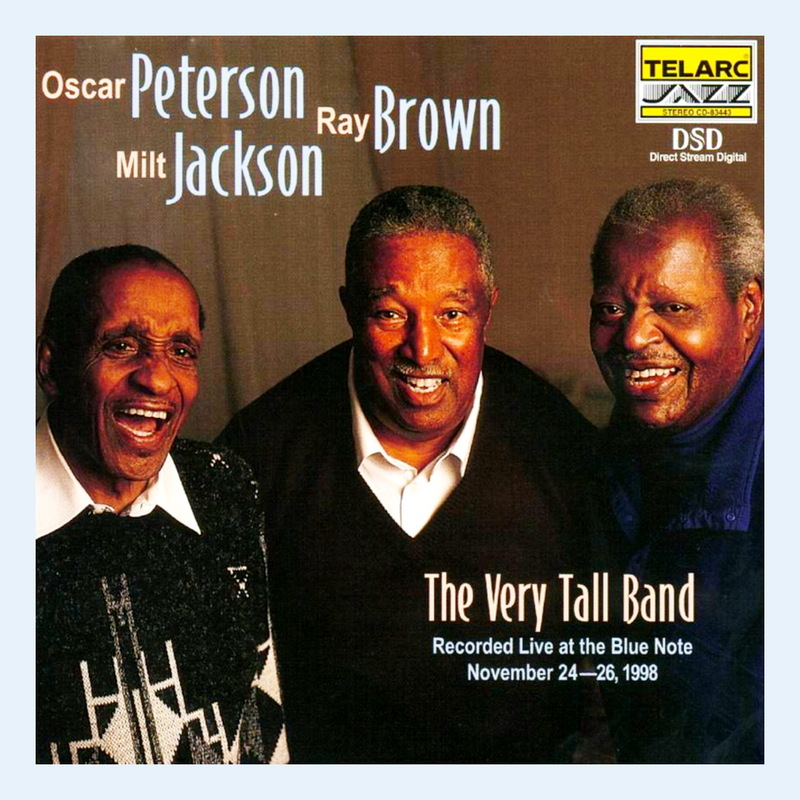 Both Jackson and Brown passed away within a handful of years after this three-night gathering, which makes What’s Up? an important document of a historical moment near the end of these musicians’ extended, influential careers. But producer Elaine Martone has done more than resurrect an evening of music for documentary purposes. This is music of venerable character, to be enjoyed simply for the musical joy it expresses. 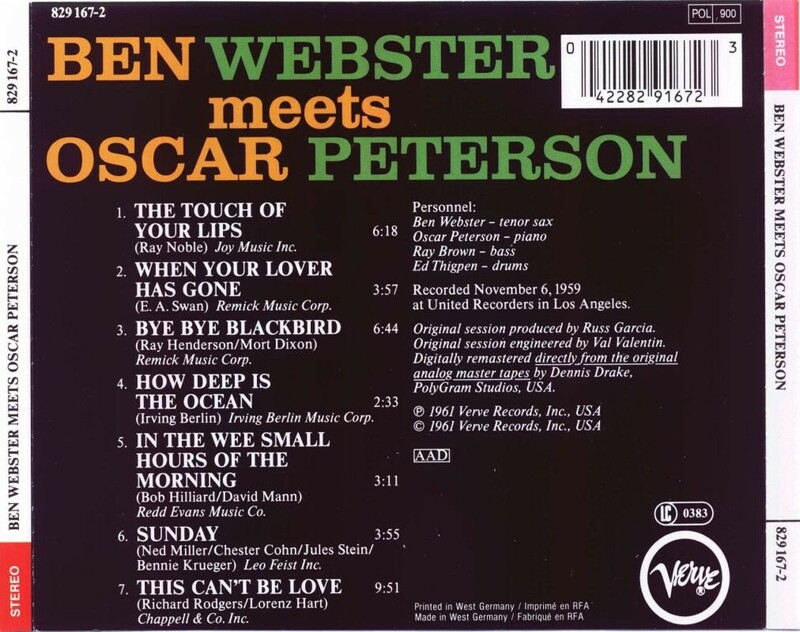 Ben Webster meets Oscar Peterson is a 1959 studio album featuring a jazz trio, led by the Canadian jazz pianist Oscar Peterson, with the tenor saxophonist Ben Webster. 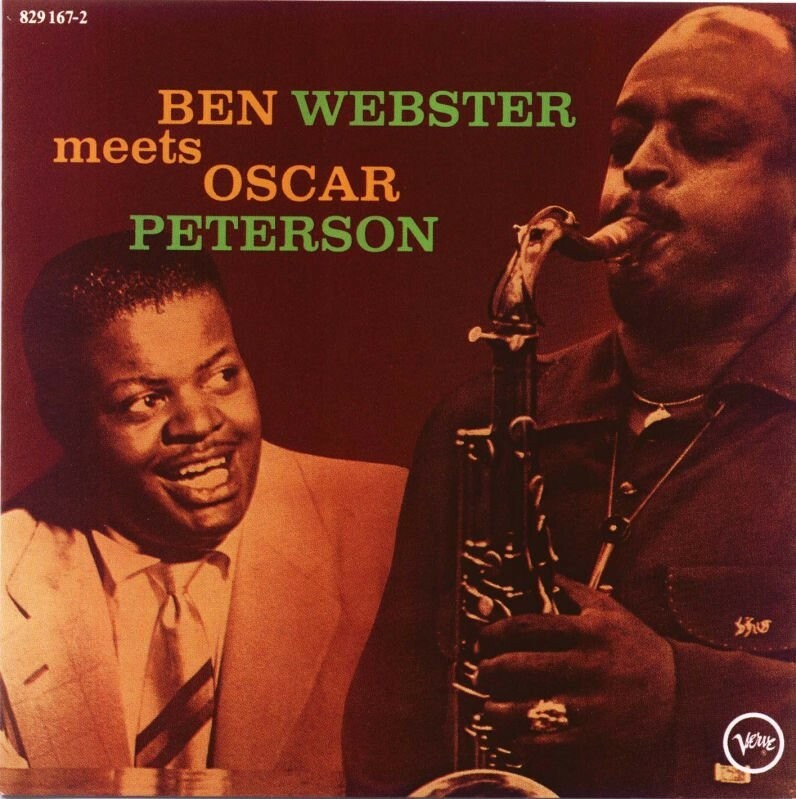 They don’t come much better than Ben Webster and Oscar Peterson. And this CD demonstrates why. From Webster’s opening on «The Touch of Your Lips» to the final notes of «This Can’t Be Love», these two great artists combined to create one of the best albums in jazz history. Its impossible to listen to this and not find yourself getting carried away. The highlight of the album, though, is Webster’s rendition of «In The Wee Small Hours of the Morning». As the liner notes state, its not surprising that Webster captures this Sinatra classic perfectly given the fact that he’d probably listened to it hundreds of times before this recording was made. All the same, the lush, lyrical, tone he achieves is simply awesome, and it lead me to wonder what a duet between Ben and Frank might’ve sounded like……. Not only do you need to buy this album right now, when you get it you need to play it as loud as possible with all the windows open. Everyone in the world deserves to hear this one. Ανάρτηση αφιερωμένη στο φίλο μου Δημήτρη Τσαγανό, που στις αρχές του ’80 μου σύστησε αυτούς τους 2 γίγαντες της μουσικής!